With its startling multi-hued cliffs, meandering rivers and tumbling waterfalls, the Karijini National Park is a worthy reward for travelers heading off-the-beaten-track in Western Australia. Sprawling for more than 600,000 hectares across the Hamersley Range, Karijini is best known for its dramatic gorges, which provide a natural playground for rafting, climbing and abseiling, and ample swimming spots. Natural highlights of the park include the Fortescue Falls at Dales Gorge; the Oxer Lookout overlooking Joffre, Weano, Red and Hancock gorges; and the 1,234-meter peak of Mount Bruce. As well as hiking and 4WD tours, Karijini National Park is renowned for its wildlife, including red kangaroos, euros, rock wallabies, echidnas and a colorful variety of birds. 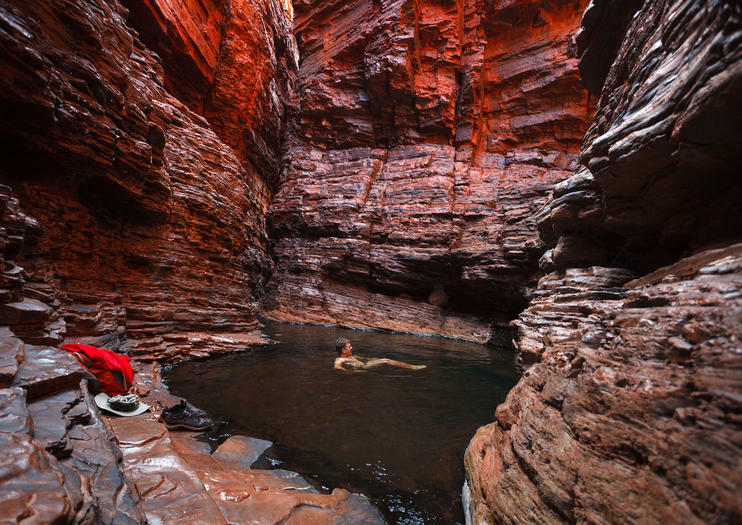 Karijini National Park is located in the Hamersley Ranges in northwestern Western Australian. The landscapes and open seas between Perth and Karijini boast some of Western Australia’s most impressive scenery, but tackling the huge distances independently can seem daunting. On this adventurous 9-day tour, reach top attractions including Kalbarri, Murchison Gorge, and the Nambung National Park in the comfort of an organized tour. With logistics like accommodation, some meals, and transportation covered, see the best of Western Australia with ease. Perth might be the capital of Western Australia, but there’s so much more to do outside the city. This nine-day trip will take you from that southern state capital to Broome in northern Kimberley, traveling along the scenic Coral Coast and stopping at a range of majestic national parks to see the sights and walk through the native bush. You don’t need to organize hotels, either: all accommodation is provided, including three days ‘glamping’ in an Eco Tent in beautiful Karijini National Park. Between Perth and Broome lie many of Western Australia’s most beautiful natural attractions, but tackling the expansive terrain solo can be a challenge. On this budget-friendly all-inclusive 14-day tour, reach sites of interest like the Cape Range National Park, Murchison Gorge, and Shark Bay with ease. With logistics like accommodation, some meals, and transportation covered, see the best of Western Australia in comfort. We are West Adventure Tours, not West comfortable, predictable and luxury tours. You can expect an adventure with us and an experience of a lifetime. What mostly makes us different from others is our bush camping experience. We will bush camp in quiet, private locations with minimal to no facilities. Each night, sitting around the campfire with a small group of friends and cooking meals on the fire and then simply roll out your swag when ready to sleep under the stars.